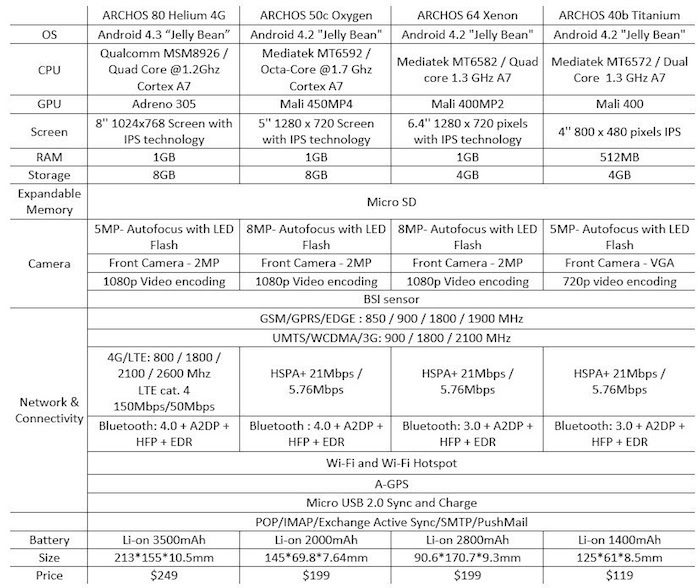 Ahead of MWC next week, ARCHOS announced four new devices that they will have on display, three phones and one tablet. There is the 80 Helium 4G (the tablet), the 50c Oxygen, 64 Xenon, and the 40b Titanium. Without being too prejudice, this is ARCHOS we are talking about, so you can expect the price to be low and specs to fit inside a budget. All three of the phones come running Android 4.2 Jelly Bean, but where they differ is in the displays and processors. The flagship of the three is the 50c Oxygen – it features a 5″ 1280 x 720 display, a Mediatek Octa-Core processor clocked at 1.7GHz (based on Cortex A7 architecture), 1GB of RAM, 8GB of storage, an 8MP rear-facing camera, and HSPA+ connectivity. The bottom rung of the three new phones is the 40b Titanium. It features a 4″ 800 x 400 IPS display, a dual-core processor clocked at 1.3GHz, 512MB of RAM, 4GB of storage, a microSD slot, 5MP rear-facing camera, and comes running Android 4.2 Jelly Bean. As for the tablet, the 80 Helium 4G, it comes with a Qualcomm quad-core processor, 1GB of RAM, 8″ 1024 x 768 IPS display, 5MP rear-facing camera, 4G LTE connectivity, Bluetooth 4.0, runs a 3,500mAh battery, comes running Android 4.3 Jelly Bean, and costs just $249. With that said, the prices are suitable for these handsets. The top tier 50c Oxygen will run you just $199, while the 40b Titanium is only $119. That’s not bad, right? If you will be attending MWC in Barcelona, be sure to stop by their booth. Denver – February 20, 2014 – ARCHOS, a pioneer in Android™ devices, unveils its lineup of cutting-edge tablets and smartphones for the first half of 2014 during Mobile World Congress, including the ARCHOS 80 Helium 4G, the industry’s first 8-inch 4G tablet under $250 and the ARCHOS 50c Oxygen smartphone with its Octa Core CPU. 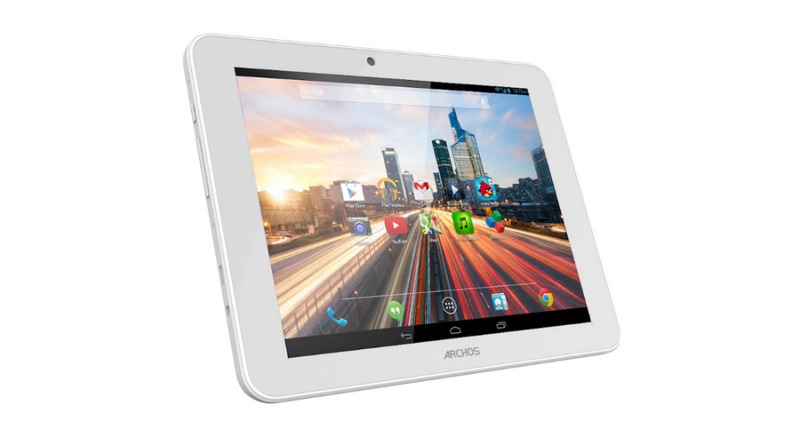 Adding to the Helium 4G range, unveiled in January at CES, comes the ARCHOS 80 Helium 4G,the world’s first 8-inch 4G tablet under $250 delivers blazing fast speeds through a Quad Core A7 processor, Android 4.3 “Jelly Bean” platform and 4G/LTE Cat 4 connectivity for faster surfing, streaming and downloading. The state-of-the-art device comes equipped with outstanding features such as high resolution screen, Bluetooth Smart technology and full access to the Google Play store. The ARCHOS 50c Oxygen wraps an HD IPS Screen (1280 x 720), Bluetooth Smart technology and a MediaTek Octa-Core processor into a super sleek (6.7mm) deep black smartphone. At less than $200, the ARCHOS 50c Oxygen, flagship of the ARCHOS smartphone range, is a Dual SIM device running Android 4.3 “Jelly Bean”. “MediaTek is very pleased to see its portfolio of dual-, quad-, and octa-core “Systems-on-a- Chip” well represented across ARCHOS’ breaking new smartphone line-up. This is another proof-point of MediaTek’s commitment in making rich multimedia features, leading edge multi-processing and multi-mode connectivity available to everyone at affordable price levels”, said Siegmund Redl, MediaTek’s VP and GM of Corporate Marketing in Europe. With its 6.4-inch HD IPS screen (1280 x 720), the ARCHOS 64 Xenon gives users the screen real estate they need for their applications, videos and games in comfort while on the go. Combined with the ARCHOS multimedia applications the ARCHOS 64 Xenon is a multimedia lover’s dream, this unlocked phablet utilizes a Quad-Core CPU for superb processing speed and is available for under $200. ARCHOS transforms the smartphone into a mobile music lover’s dream with the ARCHOS 40b Titanium. The smartphone makes listening to great music possible with its enhanced audio system and dual front facing speakers that deliver crystal clear and pure stereo sound. The $119 ARCHOS 40b is powered by a Dual-Core CPU, has a 4.0-inch IPS Panel, dual cameras and has full access to Google Play store with more than 1 million apps. At Mobile World Congress 2014 ARCHOS will also showcase its entire selection of 3G and 4G smartphones, 3G and HD tablets, and ARCHOS’ Connected Objects range (originally unveiled at CES in January 2014), the industry’s most comprehensive ecosystem of connected objects for the home and self. From February 24th to the 27th at ARCHOS’ booth – Hall 1 booth 1F20, attendees can experience the benefits of interconnectivity as well as the latest in mobile technology.